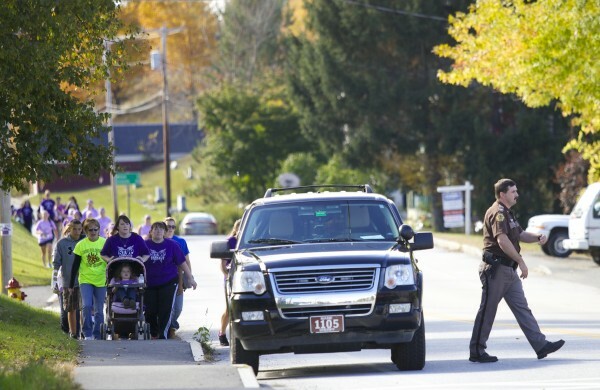 People participate in a Womancare's race and walk to end abuse in Guilfordon Oct. 6 as part of domestic violence awareness month. When abuse happens in the home, everyone in the family, including parents, children and even pets, feel the effects. In 2011 there were 5,360 reported domestic crimes in Maine. Even more chilling, about half of the homicides in Maine each year are domestic violence related. What is the effect of domestic violence on children, and why do we care? The only way to end domestic violence is with prevention. Prevention involves changing behaviors and viewpoints of children. A growing body of literature shows that children who have been exposed to domestic violence are more likely than their peers to experience a wide range of difficulties. These may include aggressive and antisocial behavior, high levels of anger and hostility, low self-esteem, depression and anxiety, difficulties in school, slower cognitive development, pro-violence attitudes, limited problem solving skills and belief in rigid gender stereotypes. Long-term studies demonstrate that males are more likely to engage in domestic violence as adults; females are more likely to be victims. So what can we do to reach children who have been through these horrific experiences? Safe Voices, the domestic violence resource center serving Franklin, Oxford and Androscoggin counties, has begun a pilot program working with children who experience domestic violence trauma. Using an evidence-based curriculum developed at the University of Michigan, advocates are able to work simultaneously with nonoffending parents and their children. They are clients of Safe Voices, and many are residing in our emergency shelter. The goal is to help mothers who have been the victims of violence reinforce their safety plan, stop blaming themselves and build their parenting skills. The goal of the children’s group is to help children understand and process the violence they have witnessed and develop their own skills around nonviolent relationship behaviors. They learn to understand that violence between their parents is not their fault, to identify vocabulary for identifying and understanding their trauma experience, to learn a broader range of conflict skills and an understanding that physical aggression is not an acceptable method for coping with conflict. Through games, discussions and puppets, these children are able to safely come to grips with what has happened to them and their family. The project also identifies children whose trauma is so great that they need to be referred to a mental health professional. Other domestic violence resource centers in the state will be offering this same program at a later date. All Maine domestic violence resource centers have educators who are in the schools teaching age-appropriate messaging. Last year the centers reached 40,648 youth with prevention and education presentations. That work is essential to help prevent violence from continuing. Jane Morrison is executive director of Safe Voices, a domestic violence resource center in Auburn.